Dislike having to focus the blog on tornadoes so much, but it is necessary in this case. Yesterday was extremely prolific day for tornadoes with at least 15 of them in west Texas. 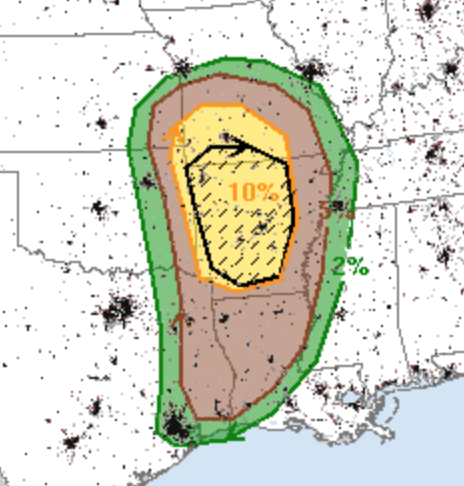 Today, the threat is at least as high only we must add in the threat of violent tornadoes in areas with higher population density. 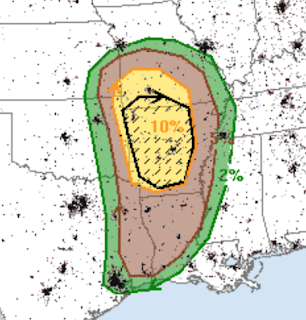 The brown area is the significant tornado threat. The yellow is an enhanced threat of tornadoes. The hatching, which includes Branson, Ft. Smith and Little Rock, is where violent tornadoes are forecast to occur. And, tomorrow will be at least as bad, only farther east. I'll have an update on that when later data comes in early this afternoon.